Use images that are at least 1200 x 630 pixels for the best display on high resolution devices. At the minimum, you should use images that are 600 x 315 pixels to display link page posts with larger images. If your image is smaller than 600 x 315 px, it will still display in the link page post, but the size will be much smaller. We've also redesigned link page posts so that the aspect ratio for images is the same across desktop and mobile News Feed. Try to keep your images as close to 1.91:1 aspect ratio as possible to display the full image in News Feed without any cropping. Also a few days ago I updated the affiliate software I use. If you're not already apart of the affiliate program, sign up and spread the word! I'm hoping to push out leenk.me version 3 soon. It will have a much improved interface and rely a lot less on the actually leenk.me website for making changes to your accounts. If there are any features that you want feel free to email me or comment below. Otherwise, I hope you all have a great holiday! A few months ago, LinkedIn opened up their companies API. It's been a busy few months, but this weekend I took the time to get this implemented in leenk.me. One of the many things on my to-do list for leenk.me. If you have a company in LinkedIn, you'll need to reauthenticate your token between LinkedIn and leenk.me, so we can access your companies. 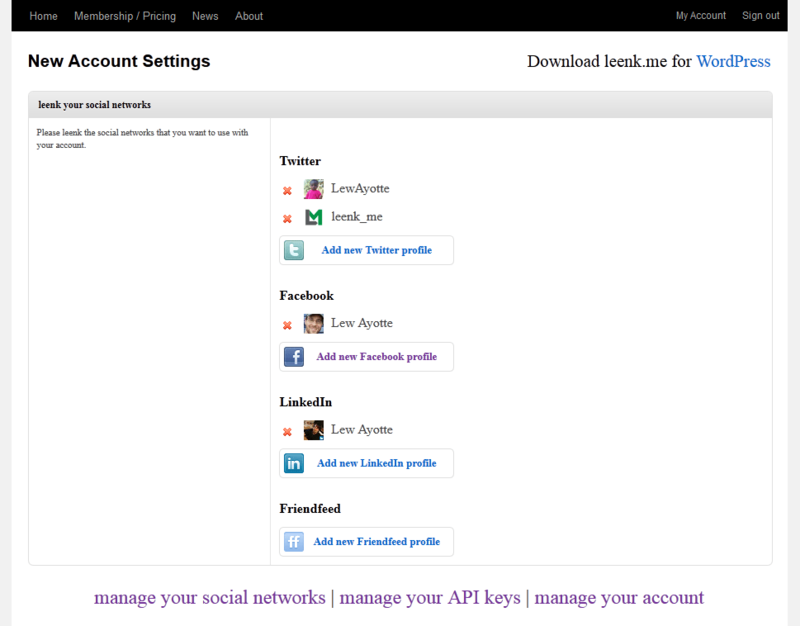 To do this, just remove the LinkedIn account from your leenk.me dashboard and readd it. You should see a new permission being request, "Company Pages". Once, you approve the new permissions from LinkedIn, go to manage your API keys, click the API key you're using to edit it and you should see a new drop down selection for LinkedIn Companies. Save your settings, and head on over to your WordPress dashboard. Make sure you're using at least version 2.0.0 of the leenk.me plugin (check for the update). Edit the LinkedIn settings for the leenk.me plugin and make sure you have "Share to Company?" checked. Save those settings and the next time you publish a post, it should send to your LinkedIn Company page. This is fairly new, so if you run into any trouble, contact us immediately. Special thanks to Andrew Kurtis from Webhosting Hub for supplying us with a Spanish translation of the leenk.me plugin for WordPress. If you're interesting in translation the plugin, check out the files in the i18n directory. This file doesn't get updated too often, but check with us first to make sure we generate a new one, in case something changes and we forget. Hey Everyone. Last night I updated the LinkedIn API leenk.me was using. This was required by LinkedIn, they are turning off their old oAuth 1.0 API and have recently brought up a new oAuth 2.0 API. Facebook did this last year (if you don't remember). This will require you to log into your account at http://leenk.me/ and remove your LinkedIn account, then re-add it. You should not need to do anything else, but you may want to visit the "manage your API keys" section to verify that your API key(s) have the proper LinkedIn settings. Sorry for any convenience, unfortunately it was a requirement from LinkedIn. As always, let me know if you have any trouble. Also, I have been getting a few requests to update to LinkedIn Company pages. Unfortunately, this is not currently allowed with LinkedIn. As soon as it is allowed, I will add it to the plugin. I am in the process of rebuilding the leenk.me site and the leenk.me plugin. It is going to be even easier to manage your connections! I hope to have the website finished in the next couple months and leenk.me 3.0 out by the end of the year. I am also planning on adding Tumblr to the plugin and I have been considering removing Friendfeed (I do not know anyone who actually uses Friendfeed). So, please tell me what you think! Introducing the leenk.me Affiliate Program! The second most requested thing I have received from leenk.me users is to create a leenk.me affiliate program. Well, guess what, I have finally gotten around to setting up the leenk.me Affiliates program. The leenk.me service was created as an affordable solution to solving the problem of publicizing your WordPress content to your social networks, automatically and instantly. The primary reason I had to ask for money was to cover the cost of server upkeep and to subsidize future upgrades and improvements to the plugin. The leenk.me Affiliates program has one tier, you get 50% of every sale and payment made by each new customer you refer to leenk.me. Each leenk.me account will continue to get their 1 month free trial, if they decide to keep the service and pay for it after the first month is over, you will get 50% of their payment. If they continue to use and pay for the leenk.me service, you will get 50% for each future payment they make. I plan on approving any pending commissions throughout the month and will payout the commissions on or around the first weekday of every month. Also, you must have a PayPal account to sign up for the leenk.me Affiliates program. We are using iDevAffiliate to manage all of the affiliate information. Now you can get paid for referring new users to the leenk.me service! Posted in Affiliates, News	| Tagged news	| Comments Off on Introducing the leenk.me Affiliate Program! The last few days have been pretty crazy, trying to get things in place for the upcoming Facebook changes has forced my hand into making some changes to the leenk.me service. These changes were already planned for the near future, but now they're becoming a reality. I've also had to place the 2.0 BETA version of the plugin on hold while I update the site/account options. 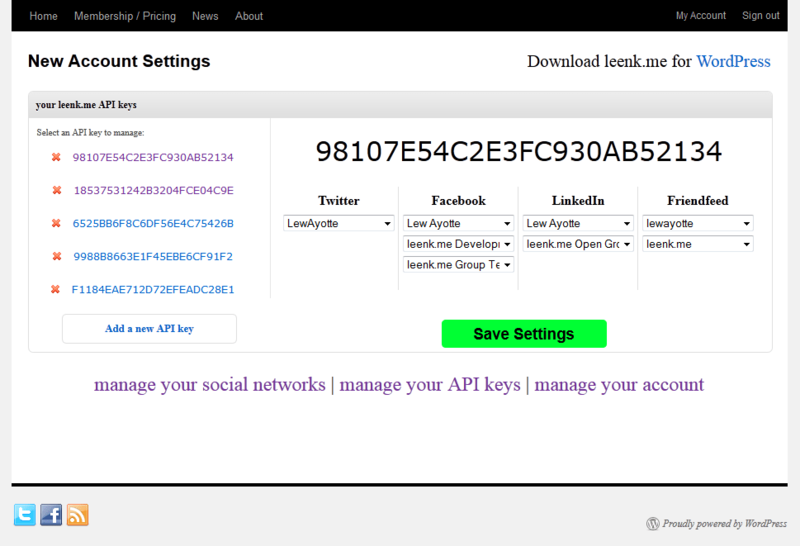 Each account will be able to create multiple API keys! If you have a single Basic account, you won't have to worry about any of these things. Due to the changes that Facebook is going to make on May 2nd, this will severely affect how people with multiple Basic or Plus accounts use the service. In many cases, if you had 2 or 3 separate Basic accounts, all using the same Facebook profile, you'll be able to go down to 1 Basic account! I haven't nailed everything down yet, but I am currently thinking that Basic accounts will get 3 APIs, Plus accounts will get 10 APIs, and I'll probably discontinue the Basic account option for future customers. Also, one last thing, when the new account settings pages are live, I'll release a new version of the plugin which will use a new version of the leenk.me API. To use this, you'll need to go through an "account conversion" process to convert your existing leenk.me settings to the new account methodology. This will be true for everyone, but it should be pretty straight forward and not very difficult to deal with. I'll let you all know as I finalized these details! Until then, happy blogging! Posted in News	| Comments Off on leenk.me Changes Coming Soon! I wanted to give you all a head up that Facebook is making some changes that will (and for some people already have) affect leenk.me. I've notice a few people who have had an "expiration" time attached to the access token that Facebook give leenk.me. The access token is what allows leenk.me to send content on your behalf when you publish a new post. The way Facebook use to work is 3rd party developers like myself could request an access token with "offline access", which basically meant it worked forever (or until the user changed their password or remove the app from their profile). Facebook is now planning on removing the offline access ability from their API. So, in preparation for this change (which is coming May 2nd, 2012), I have been testing their new requirements and have already made a few changes to leenk.me to start to deal with what Facebook is requiring. Over the next week I will continue to make changes until I have a solution in place that will cause YOU the least amount of pain. So far it is going well though. I've removed the request for the "offline access" and have set my app in Facebook to disable that feature altogether. Facebook is handle these access tokens in two ways, it will hand out a token that expires in 2-hours or a token that will expire in 60-days. I am still testing the 60-day tokens to make sure they will work as I expect them to. It looks like I will be able to "renew" the 60-day tokens before they expire to get a new 60-day token. Basically replicating the previous "offline access" token I was able to use. However, in the case that I am unable to do this, it may require you to reset your Facebook connection to leenk.me every 60 days. While I am working on this, I have also started implement some new error reporting within the beta version of the leenk.me plugin. Ultimately, this change by Facebook is pushing back the development of the plugin, but I think in the end we'll all be better off. There will be better error reporting and more helpful messages. Facebook is by far that social network that I end up having to do the most support for. Let's just say that they do not handle the oAuth standard in a "traditional" manner. As I said, my goal here is to make this as simple as possible and not require you to do any extra work. Hopefully that goal will be accomplished. If you have any questions or need any support, as always, feel free to contact me.